This is the perfect and tried recipe to reduce belly fat. 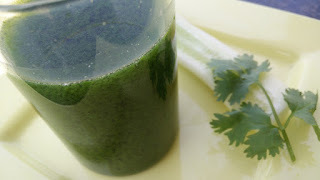 Coriander cucumber drink help reduce belly fat when consumed everyday in morning. It keeps you energetic and one feels light throughout the day. 1. In a blender jar, add all ingredients except Lime juice. Blend to form a juice. 2. Sieve the juice and add lemon juice. Do it reduce the tummy fat gained after pregnancy?